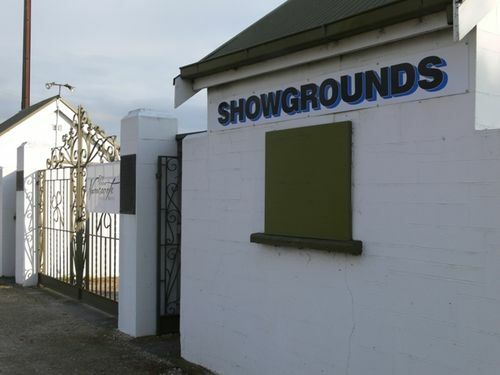 Gates at the showground commemorate Sydney Shepherd for his contribution to the pastoral industry for over 50 years. Sydney Shepherd was the owner of "Mullinger Park" a property of 4634 acres. The raker used in raking the clover crop on the property was invented and patented by Sydney. He also invented the Shepherd Super Broadcaster in 1927. The machine was used extensively in the pastoral areas of South Australia, Victoria and Western Australia. During World War Two, over 1000 broadcasters were sold in England, where they were manufactured under licence. Sydney also invented the Rabbit Ripper which was used for the destruction of rabbit warrens. A leveller designed and made by the owner of 'Mullinger Park' was used to reclaim much of the Bay of Biscay (or Crabhole Country) in the Kybybolite district with success. Proof that his estate was run on the most modern and economic lines was shown by the fact that on two occasions, Sydney won the farm competition for the best worked farm in Naracoorte and surrounding districts. Each had to be won twice in succession. He exhibited at many sheep shows with much success and secured a first, second and grand champion prizes. Sydney was president of the Naracoorte Pastoral and Agricultural Society, president of Local Stockowners Association and a member of the Advisory Board of Agriculture for South Australia for 23 years, chairman from 1939-1941, life member of the Agricultural Bureau of South Australia and represented the Kybybolite Ward in the Naracoorte District Council from 1922-1926. In 1934, Sydney was given a honorary commission by the government of South Australia, to inquire into agricultural matters abroad. On Saturday afternoon the Premier (Mr. Playford) will officially open the Shepherd memorial gates at the Naracoorte Pastoral and Agricultural Society's showgrounds. The memorial is erected to the late Mr. Sid Shepherd, OBE, who died last year, and is a tribute to his services to agriculture over a period of 50 years. The Advertiser (Adelaide), 10 April 1953. Naracoorte Pastoral and Agricultural Society Inc. These gates were erected by public subscription to the memory of Sydney Shepherd O.B.E. 1875 - 1952 in recognition of his outstanding service to the pastoral development of this district.